Anna Marie "Patty" Duke (December 14, 1946 – March 29, 2016) was an American actress, appearing on stage, film, and television. Her first big break came from her Academy Award winning performance at age 16 for portraying Helen Keller in The Miracle Worker (1962), a role that she had originated on Broadway. The following year she was given her own show, The Patty Duke Show, in which she played the dual role of "identical cousins" Cathy and Patty Lane. She later progressed to more mature roles such as that of Neely O'Hara in the film Valley of the Dolls (1967). Over the course of her career, she received ten Emmy Award nominations and three Emmy Awards as well as two Golden Globe Awards. Duke also served as president of the Screen Actors Guild from 1985 to 1988. Forest Cemetery, Coeur d'Alene, Idaho, U.S.
Duke was diagnosed with bipolar disorder in 1982, after which she devoted much of her time to advocating for and educating the public on mental health. Duke was born in Manhattan, New York, the youngest of three children of Frances Margaret (née McMahon; 1913–1993), a cashier, and John Patrick Duke (1913–1964), a handyman and cab driver. She was of Irish, and more distant German, descent. Duke, her brother Raymond, and her sister Carol experienced a difficult childhood. Their father was an alcoholic, and their mother suffered from clinical depression and was prone to violence. When Duke was six, her mother forced her father to leave the family home. When Duke was eight, her care was turned over to talent managers John and Ethel Ross, who, after promoting Patty's brother, were looking for a girl to add to their stable of child actors. The Ross's methods of managing Duke's career were often unscrupulous and exploitative. They consistently billed Duke as being two years younger than she actually was and padded her resume with false credits. They gave her alcohol and prescription drugs, took unreasonably high fees from her earnings and made sexual advances to her. In addition, the Rosses made Duke change her name. "Anna Marie is dead," they said, "you're Patty now." They hoped that Patty Duke would duplicate the success of Patty McCormack. One of Duke's early acting roles was in the late 1950s on the soap opera The Brighter Day. She also appeared in print ads and in television commercials. In 1959, at the age of 12, Duke appeared on The $64,000 Question and won $32,000; her category of expertise, according to her autobiography “Call Me Anna”, was popular music. In 1962, it was revealed that the game show had been rigged, and she was called to testify before a panel of the United States Senate. Duke eventually testified before Congressional investigators—and broke into tears when she admitted she'd been coached to speak falsely. Also in 1959, Duke appeared in a television adaptation of Meet Me in St. Louis as Tootie Smith, the role that had been originated in the film version by Margaret O'Brien. Duke's first major starring role was Helen Keller, (with Anne Bancroft as Anne Sullivan), in the Broadway play The Miracle Worker, which ran from October 1959 to July 1961. During the run, Duke's name was elevated above the play's title on the theater's billboard, believed to be the first time this had been done for such a young star. The play was subsequently made into a 1962 film for which Duke received the Academy Award for Best Supporting Actress; before the film started shooting, the actress and activist briefly met. At 16, Duke was the youngest person at that time to have received an Academy Award in a competitive category. Duke returned to television, this time starring with Laurence Olivier and George C. Scott in a television production of The Power and the Glory (1961). Duke with Helen Keller, whom she portrayed in both the play and the film The Miracle Worker (1962). Duke's own series, The Patty Duke Show, created by Sidney Sheldon especially for her, began airing in September 1963. At that time, it was not known that Duke had bipolar disorder, but Sheldon did notice that she had two distinct sides to her personality and thus developed the concept of identical cousins with contrasting personalities. Duke portrayed both main characters: Patricia "Patty" Lane, a fun-loving American teenager who occasionally got into trouble at school and home, and her prim and proper "identical cousin" from Scotland, Catherine "Cathy" Lane. William Schallert portrayed Patty's father, Martin; Jean Byron played her mother, Natalie; Paul O'Keefe was her younger brother, Ross; and Eddie Applegate portrayed her boyfriend, Richard Harrison. The show also featured such high-profile guest stars as Sammy Davis, Jr., Peter Lawford, Paul Lynde, and Sal Mineo. The series lasted three seasons and earned Duke an Emmy Award nomination. In 1999, the program's characters were revisited and updated in The Patty Duke Show: Still Rockin' in Brooklyn Heights, with Cindy Williams taking on the villain role of Sue Ellen Turner when Kitty Sullivan was unable to reprise her role. After the cancellation of The Patty Duke Show in 1966, Duke began her adult acting career by playing Neely O'Hara in Valley of the Dolls (1967). The film was a box-office success, but audiences and critics had a difficult time accepting all-American-teenager Duke as an alcoholic, drug-addicted singing star. While the film has since become a camp classic—thanks in large part to Duke's over-the-top performance—at the time it almost ruined her career. In 1969, Duke starred in Me, Natalie, in which she played an "ugly duckling" Brooklyn teenager struggling to make a life for herself in the Bohemian world of Greenwich Village. Duke won the Golden Globe Award for Best Actress (Musical or Comedy) for the role. Duke returned to television in 1970, starring in a made-for-TV movie, My Sweet Charlie. Her portrayal of a pregnant teenager on the run won Duke her first Emmy Award. Her acceptance speech was rambling and disjointed, leading many in the industry to believe she was drunk or using drugs at the time. In fact, Duke was experiencing a manic phase of her bipolar disorder, which would remain undiagnosed until 1982. She received her second Emmy in 1977 for the TV miniseries Captains and the Kings and her third in 1980 for a TV version of her 1979 stage revival of The Miracle Worker, this time playing Anne Sullivan to Melissa Gilbert's Helen Keller. Her turns in the made-for-TV movies The Women's Room (1980) and George Washington (1984) both garnered her Emmy nominations. In the 1980s, Duke was cast in a number of short-lived TV series: the ABC sitcom It Takes Two, from Soap and Benson creator Susan Harris, was cancelled after one season; Hail to the Chief, in which she appeared as the first female President of the United States; and a comedy, Karen's Song, which aired on the fledgling Fox network. Duke's film roles in the 1980s included the Canadian film By Design (1981), which garnered her a Genie Award nomination for Best Foreign Actress, and the made-for-TV movie A Time to Triumph (1986), the true story of Concetta Hassan, a woman who struggles to support her family after her husband is injured but who eventually becomes a United States Army helicopter pilot. In 1990, Duke's autobiography, Call Me Anna, was adapted for television; she played herself from her mid thirties onward. In 1992, Duke portrayed the mother of Meg Ryan's character in the film adaptation of the play Prelude to a Kiss. Duke received an Emmy nomination in 1999 for her appearances in three episodes of Touched by an Angel. In 1985, Duke became the second woman, after Kathleen Nolan, to be elected president of the Screen Actors Guild, a post she held until 1988. Her tenure as president was marked by factional in-fighting and controversy; however, she gained respect for managing to maintain solidarity among the guild's members. During her term, she led industrial actions and contract negotiations and oversaw the relocation of the guild's headquarters. Duke gradually reduced her work schedule in the 2000s but took occasional TV roles, including guest appearances on shows such as Glee and the reboot of Hawaii Five-0. In 2011, she joined the cast of the drama The Protector. She also returned to the stage on occasion — in 2002 as Aunt Eller in a revival of Oklahoma! on Broadway and in 2009 as Madame Morrible in the San Francisco production of the musical Wicked. In May 2011, Duke directed the stage version of The Miracle Worker at the now defunct Interplayers Theater in Spokane, Washington. In 2011, Duke appeared in public service announcements for the U.S. Government, promoting the social security website. In several, she appeared as Patty and Cathy using split-screen effects. In others, she appeared with George Takei wearing a Star Trek-like costume. In 2015, Duke made her final TV appearance, guest-starring on Liv and Maddie as Grandma Janice and Great-aunt Hilary, a pair of identical twins. Duke had a successful singing career, including two Top 40 hits in 1965, "Don't Just Stand There" (#8) and "Say Something Funny" (#22). She also performed on TV shows such as The Ed Sullivan Show. In 1987, Duke revealed in her autobiography that she had been diagnosed with manic depression (now called bipolar disorder) in 1982, becoming one of the first public figures to speak out about personal experience of mental illness. Her treatment, which included the use of lithium as a medication and therapy, successfully stabilized her moods. She subsequently became an activist for mental health causes. She lobbied the United States Congress and joined forces with the National Institute of Mental Health and the National Alliance on Mental Illness in order to increase awareness, funding and research for people with mental illness. In 2007, Duke appeared on The Oprah Winfrey Show, talking about her bipolar disorder. Duke wrote three books: her autobiography, Call Me Anna (ISBN 0-553-27205-5) in 1987 and Brilliant Madness: Living with Manic Depressive Illness (ISBN 0-553-56072-7) in 1992. A third book, In The Presence of Greatness—My Sixty Year Journey as an Actress (ISBN 9781629332352) (with William J. Jankowski), is a collection of essays about the actress's experiences with other artists and celebrities. It was published posthumously in February 2018. On August 17, 2004, Duke received a star on the Hollywood Walk of Fame for her contribution to the motion picture industry. On December 14, 2007, her 61st birthday, Duke was awarded an honorary Doctorate in Humane Letters degree from the University of North Florida for her work in advancing awareness of mental health issues. On March 6, 2010, she was awarded an honorary Doctor of Humane Letters degree from the University of Maryland Eastern Shore. Duke was married four times and had three children. In 1965, Duke married director Harry Falk, who was 13 years her senior. During their marriage, she had repeated mood swings, drank heavily, became anorexic and overdosed on pills a number of times. The couple divorced in 1969. In early 1970, at the age of 23, Duke became involved with three men at the same time: 17-year-old Here's Lucy star Desi Arnaz, Jr., actor John Astin, who was 16 years her senior, and rock promoter Michael Tell. The relationship with Arnaz was widely publicized, due in part to the vocal and public opposition of Arnaz's mother, actress and production company executive Lucille Ball. By late spring, Duke and Arnaz had broken off their relationship. In June 1970, Duke learned she was pregnant and married Michael Tell on June 26, 1970, during a manic phase,[better source needed] in order to "give (her child) a name". Their marriage lasted 13 days before ending in an annulment on July 9, 1970; Her son, actor Sean Astin, was born on February 25, 1971. Duke said in her 1987 autobiography that the marriage to Tell was never consummated and that Astin was the actual biological father of Sean. There were several chapters emphasizing the lie about her relationship with Tell and the paternity of her son. She later told Sean that Arnaz Jr. was Sean's biological father. It turned out that all three statements were incorrect: in 1994, Sean Astin underwent biological testing to determine his paternity and the results showed that Astin's biological father is actually Tell. Duke married John Astin in August 1972. Astin adopted Sean and the couple had a son, actor Mackenzie Astin, in 1973. Duke and Astin worked together extensively during their marriage and she took his name professionally, becoming "Patty Duke Astin". Duke adopted Astin's three sons, and years later in 1998 Astin's sons reversed the adoption with Duke's approval. The couple divorced in 1985. Duke married her fourth husband, drill sergeant Michael Pearce, in 1986, and remained married to him until her death 30 years later. Duke and Pearce had met during the production of A Time to Triumph, for which Pearce served as a consultant. The couple moved to Hayden, Idaho and adopted a son, Kevin, who was born in 1988. From her marriage to Pearce until her death in 2016, Duke occasionally used the name "Anna Duke-Pearce" in her writings and other professional work. Duke had three granddaughters by her eldest son Sean: actresses Alexandra, Elizabeth, and Isabella. Duke died on the morning of March 29, 2016  in Coeur d'Alene, Idaho of sepsis from a ruptured intestine at the age of 69. Sean invited the public to contribute to a mental health foundation in his mother's name, the Patty Duke Mental Health Initiative. She was interred at Forest Cemetery in Coeur d'Alene. 1956 Armstrong Circle Theatre Marianne Doona / Angelina Rico "SOS from the Andrea Doria", "Flare-Up"
1957 Armstrong Circle Theatre Gina "Have Jacket, Will Travel"
1958 DuPont Show of the Month Young Cathy "Wuthering Heights"
1958 Kraft Television Theatre Betty / Roberta "A Boy Called Ciske", "Death Wears Many Faces"
1958 The United States Steel Hour Kathy "One Red Rose for Christmas"
1959 The United States Steel Hour Sonya Alexandrovna / Robin Kent "Family Happiness", "Seed of Guilt"
1962 Ben Casey Janie Wahl "Mrs. McBroom and the Cloud Watcher"
1962 The United States Steel Hour Penelope "The Duchess and the Smugs"
1963 Wide Country Cindy Hopkins "To Cindy, with Love"
1967 The Virginian Sue Ann McRae "Sue Ann"
1969 Journey to the Unknown Barbara King "The Last Visitor"
1970 Matt Lincoln Sheila "Sheila"
1971 Night Gallery Holly Schaeffer "The Diary"
1972 The Sixth Sense Elizabeth "With Affection, Jack the Ripper"
1972 Owen Marshall, Counselor at Law Lois "Love Child"
1973 Hawaii Five-O Toni "Thanks for the Honeymoon"
1973 Ghost Story Linda Colby "Graveyard Shift"
1974 ABC's Wide World of Entertainment Adelaide "Hard Day at Blue Nose"
1974 The ABC Afternoon Playbreak Melanie Kline "Miss Kline, We Love You"
1974 Insight Margie "The One-Armed Man"
1975 Police Story Daniele "Sniper"
1975 Police Woman Larue Collins "Nothing Left to Lose"
1975 Marcus Welby, M.D. Kate Gannard "Unindicted Wife"
1976 The Streets of San Francisco Susan Rosen "The Thrill Killers: Parts 1 & 2"
1976 Insight Annie Grogan "For the Love of Annie"
1977 Insight Loretta Berg "A Slight Drinking Problem"
1977 Rosetti and Ryan Sylvia Crawford "Men Who Love Women"
1978 Insight Nelli Grubb "Second Chorus"
1981 Insight Mother Alicia "God's Guerillas"
1983 Insight Peters "The Hit Man"
1985 Hotel Gayla Erikson "New Beginnings"
1987 It's a Living Patty Duke "The Evictables"
1987 J.J. Starbuck Verna Mckidden "Pilot"
1991 The Torkelsons Catharine Jeffers "Return to Sender"
1991 The Legend of Prince Valiant Lady Morgana (voice) "The Trust Betrayed", "The Awakening"
1997 Frasier Alice (voice) "Death and the Dog"
1998 Touched by an Angel Nancy Williams "I Do"
2001 Family Law Judge Sylvia Formenti "Liar's Club: Part 2"
2001 First Years Evelyn Harrison "There's No Place Like Homo"
2003 Touched by an Angel Jean "I Will Walk with You: Parts 1 & 2"
2004 Judging Amy Valerie Bing "Disposable"
2011 The Protector Beverly "Wings", "Blood"
2011 Hawaii Five-0 Sylvia Spencer "Mea Makamae"
2012 Drop Dead Diva Rita Curtis "Freak Show"
2013 Glee Jan "All or Nothing"
2015 Liv and Maddie Grandma Janice / Great-Aunt Hillary "Grandma-A-Rooney"
Patty Duke Sings Folk Songs: Time To Move On United Artists (Unreleased ) 1968 Note: After years of remaining unreleased, Patty Duke Sings Folk Songs: Time To Move On was finally released by Real Gone Music (under Capitol records) on CD and digital download in 2013. 1965 "Don't Just Stand There"
1966 "Whenever She Holds You"
"Little Things Mean A Lot"
"The Wall Came Tumbling Down"
1967 "Come Live With Me"
1968 "And We Were Strangers"
^ Blake, Meredith; and Hill, Libby. "Patty Duke dies at age 69; Oscar-winning actress and mental health advocate", Los Angeles Times, March 29, 2016. Accessed March 19, 2019. "The actress was born Anna Marie Duke on Dec. 14, 1946, in Elmhurst, N.Y., the youngest of three children in a blue-collar family plagued by alcoholism and mental illness." ^ a b c d e f g h i "Oscar-winning former child star Patty Duke dies, age 69". USA TODAY. Retrieved March 30, 2016. ^ a b c d e "Patty Duke Dead: 'Miracle Worker' Star Was 69". The Hollywood Reporter. Retrieved March 30, 2016. ^ a b "Winners & Nominees Actress In A Leading Role - Musical Or Comedy (1970)". GoldenGlobes.com. Golden Globe Awards. Retrieved December 30, 2018. ^ "Patty Duke Biography (1946–2016)". FilmReference.com. Retrieved August 4, 2010. ^ a b c Duke, Patty; Kennen Turan (1987). Call Me Anna: The Autobiography of Patty Duke. Bantam Books. p. 8. ISBN 0-553-27205-5. ^ a b c d e Lipton, Michael A. (May 3, 1999). "Duke of Hazards; Having Survived a Hellish Youth and Manic Depression, Patty Duke Relishes Her Rustic Life Down on the Farm". People. 51 (16). Retrieved August 15, 2009. ^ a b c d e f Yahr, Emily (March 29, 2016). "Patty Duke: The original survivor of dysfunctional child stardom". The Washington Post. ISSN 0190-8286. Retrieved March 30, 2016. ^ "TV Preview: Patty Duke pairs off again as 'Identical cousins'". Pittsburghpostgazette.com. April 27, 1999. Retrieved August 4, 2010. ^ "Biography". Officialpattyduke.com. Archived from the original on August 4, 2003. Retrieved August 4, 2010. ^ Miller, Julie. "Patty Duke, 1960s Film and TV Sweetheart, Dies at 69". Vanity Fair. Retrieved March 30, 2016. ^ "The American Experience Quiz Show Scandal Sonny Fox contestant Patty Duke". PBS. Retrieved June 20, 2017. ^ "The Quiz Show Scandal: Program Transcript". PBS. Retrieved June 20, 2017. ^ Gugliemi, Jodi (March 31, 2016). 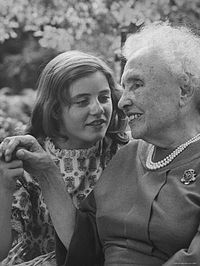 "Patty Duke Pictured Meeting Helen Keller, the Inspiration Behind The Miracle Worker, in 1961". People. ^ "Special Collectors' Issue: 50 Greatest TV Stars of All Time". TV Guide. 1996. ^ Duke, Patty; Kennen Turan (1987). Call Me Anna: The Autobiography of Patty Duke. Bantam Books. p. 187. ISBN 0-553-27205-5. ^ "Actress Patty Duke dead at 69". CNN. Retrieved March 30, 2016. ^ "Karen's Song". TV Guide. Retrieved March 30, 2016. ^ a b Robb, David. "Patty Duke's SAG Legacy: Peacemaker During Turbulent Times". Deadline. Retrieved March 30, 2016. ^ "'Glee' Casts TV Legends". The Huffington Post. Retrieved March 30, 2016. ^ "'The Protector': Veteran Actress Patty Duke Joins the New Lifetime Series". The Hollywood Reporter. Retrieved March 30, 2016. ^ "Patty Duke, Broadway's Original Helen Keller, Dies at 69". TheaterMania.com. Retrieved March 30, 2016. ^ "Patty Duke Joins Wicked San Francisco Cast as Madame Morrible Wicked Tour". wickedtour.net. Retrieved March 30, 2016. ^ Jim (May 7, 2011). "Review of Duke-directed 'Miracle Worker' – Spotlight – Spokesman.com – May 7, 2011". Spokesman.com. Retrieved February 3, 2013. ^ Heller, Corrine. "Patty Duke, George Takei in 'Star Trek' videos". On The Red Carmet. ^ "First Look: Patty Duke Doubles Up on Disney Channel's Twins Sitcom Liv and Maddie". TVGuide.com. Retrieved March 30, 2016. ^ "Don't Just Stand There". Songfacts.com. Retrieved January 30, 2010. ^ "CTVA US Music Variety "The Ed Sullivan Show" (CBS) Season 20 (1967–68)". ctva.biz. Retrieved March 30, 2016. ^ "Patty Duke Biography – Fandango". Fandango. Retrieved March 30, 2016. ^ "Patty Duke bipolar disorder". Bipolar Lives. Retrieved March 30, 2016. ^ "Patty Duke". Hollywood Walk of Fame. August 14, 2004. Retrieved March 29, 2016. ^ Department of Media Relations and Events (December 6, 2007). "Duke Awarded Honorary Degree/Senior Recognized for Service" (Press release). University of North Florida. Retrieved March 26, 2016. ^ "UMES Prepares for 'The Magnificent Seven'". Office of Public Relations. University of Maryland Eastern Shore. Archived from the original on April 10, 2016. Retrieved March 29, 2016. ^ a b c Duke, Patty; Kennen Turan (1987). Call Me Anna: The Autobiography of Patty Duke. Bantam Books. p. 231. ISBN 0-553-27205-5. ^ Barrett, Victoria (December 19, 2003). "'I don't want to play the fat guy or the friend all my life' (interview with Sean Astin)". The Guardian. London. Retrieved August 15, 2009. ^ "Local Publisher's Son in Spotlight". Las Vegas Review Journal. February 29, 2004. Retrieved August 15, 2009. ^ Astin, Allen (April 4, 2016). "Anna's Passing". Retrieved June 5, 2017. Years later, as an adult, I felt that the adoption was a mistake and I asked Anna if she would be hurt if I reversed the adoption and/or would she contest the action. She was happy for me and completely agreed that the reversal was the right decision. ^ Dwilson, Stephanie Dube. "Patty Duke's Family: Photos of Her Children & Grandkids". Heavy.com. Retrieved March 30, 2016. ^ "Patty Duke Is Dead at 69". abcnews.com. Retrieved March 29, 2016. ^ Puente, Maria (March 29, 2016). "Oscar-winning former child star Patty Duke dies, age 69". USA Today. Retrieved March 29, 2016. ^ "Patty Duke's Son, Sean Astin, Pays Tribute to Late Mother". The Hollywood Reporter. Retrieved March 30, 2016. ^ Staff (May 26, 2016). "Here are the final resting places for 11 television stars". MeTV. Retrieved September 18, 2017. ^ Craig Emery. "Sings Folk Songs". The Official Patty Duke Website. Archived from the original on July 20, 2011. Retrieved March 6, 2011. Duke, Patty; Kennen Turan (1987). Call Me Anna: The Autobiography of Patty Duke. Bantam Books. p. 231. ISBN 0-553-27205-5. Wikimedia Commons has media related to Patty Duke.